Inspired by all things train, Jeffrey Miller, MFA, is equal parts education, natural talent, and life experience. 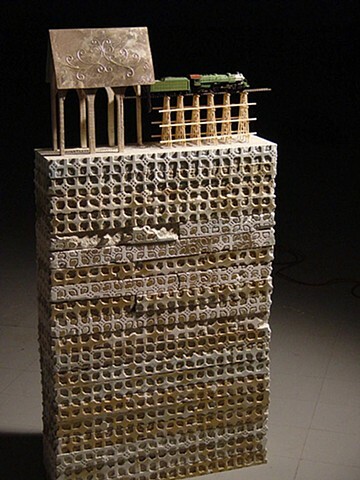 His acquired expertise in Installation and Assemblage from Pratt Institute, NYC, expresses the quality of his ideas, which provide a solid foundation for technical and spontaneous expression in a variety of media. The mass, volume and shape of rail cars, train parts, steam, the structure of railway bridges and tunnels, history, lore and legend, pressure, memory, the architecture of train stations, dreams, icons, the weight of track, the taste and the smell of iron, all hold promise and mystery. Miller uses the image and substance of these as a way to process thoughts and feelings in relationship to what is happening in the immediate environment; a filter through which the everyday and the sublime pass. A "Manifest" is a train made up of mixed railcars (box cars, tank cars, piggybacks, passengers, etc). Imagine, if you will this powerhouse barreling down a length of track with enormous weight and velocity, on only two thin rails. All that power delicately controlled must be one of the most graceful things imaginable. Yet, one slight mistake and everything derails. The combustible fuel, the refrigerators, the timber, the toxic chemicals, the food, the stereo equipment, the railcars themselves… it’s all going straight to Hell. It would appear each of us is a manifest train, hauling railcars of emotion, thought, and experience. These railcars are of our own design, to a large extent, and our challenge in this world is to comprehend this strange fact; to emerge from a veil of darkness into the full light of conscious creation and then perhaps beyond, where the tracks, the train, and the engineer all disappear back into each other.